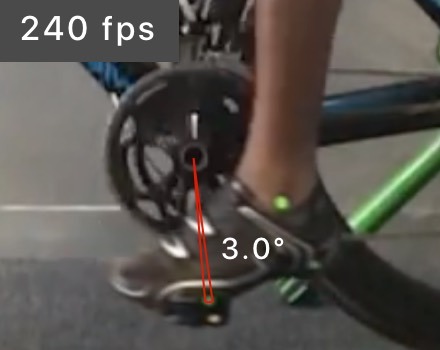 There is a significant difference between the cameras on older iPhones/iPads and on the newer models that directly impact the quality of your bike fit videos. In general, iPhone cameras are better than iPad cameras and newer is better than older models. The maximum frame rate for iPhone/iPad cameras ranges from 30 frames per second (fps) on the oldest models to 240 fps on the newest. 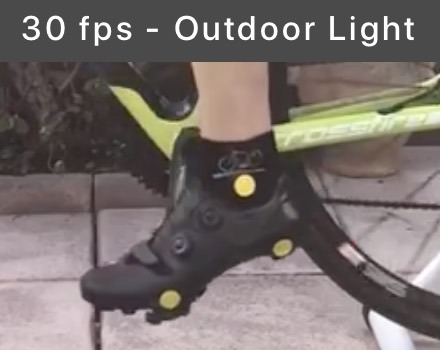 The significance of frame rate is how many frames are captured in a full pedal stroke. So for example below, recorded at 30 fps there are 13.2 degrees of rotation between frames at 30 fps versus 3.0 degrees at 240 fps. 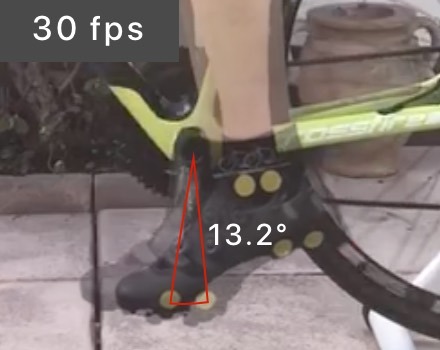 For measurements that need to be recorded at the bottom of the stroke, like Knee Angle, the results will be much more accurate with the higher frame rate. 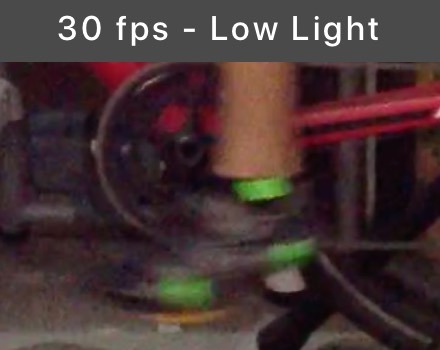 If you are using a slower camera (one that records at 30 fps or 60 fps), one way to improve the quality is to pedal at a slower cadence. This basically gives more frames per revolution to analyze. Don't go too slow though or your pedal stroke won't reflect your normal motion. In addition to capturing at a higher frame rate, the newer cameras are better at capturing fast action, especially at lower light levels. With a 30 fps camera with indoor lighting conditions, they video will typically have a "smeared" quality (see below). Bike Fast Fit Elite may have difficulty tracking the dots when the dots get too smeared. If you see this smearing, try improving the lighting or recording outside. The newer cameras do a much better job capturing crisp video in all but the worst lighting conditions.